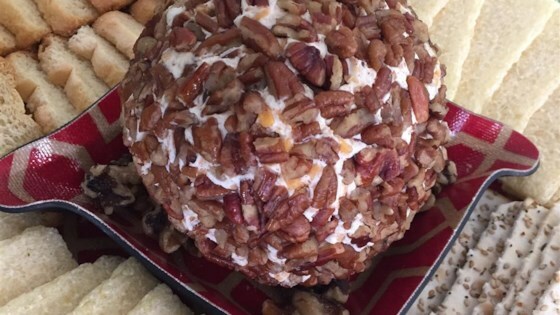 "A delicious and easy way to enjoy a cheese ball. Serve with crackers and enjoy! You can cut this recipe in half to make a smaller version. You could substitute Colby, mozzarella, or Monterey Jack cheese for the Cheddar the recipe calls for." In a medium size bowl, mash cream cheese. Mix dressing mix and Cheddar cheese into the cream cheese. Shape the mixture into a ball. Roll the ball in the chopped nuts. Refrigerate covered until ready to serve. Yum! This is a fantastic recipe, very easy. Be sure to try toasting the pecans first! The ranch dressing really makes this cheese ball delicious! I love cheese anyway, but this was soooooo good. I will make this all the time!